Can you believe it’s already time for Back to School? Summer flew by WAY too fast! Throughout the rest of the month, I’ll be sharing all of my favorite things for your kids to get them ready for another fun school year! Check back often for inspiration and some fun giveaways! 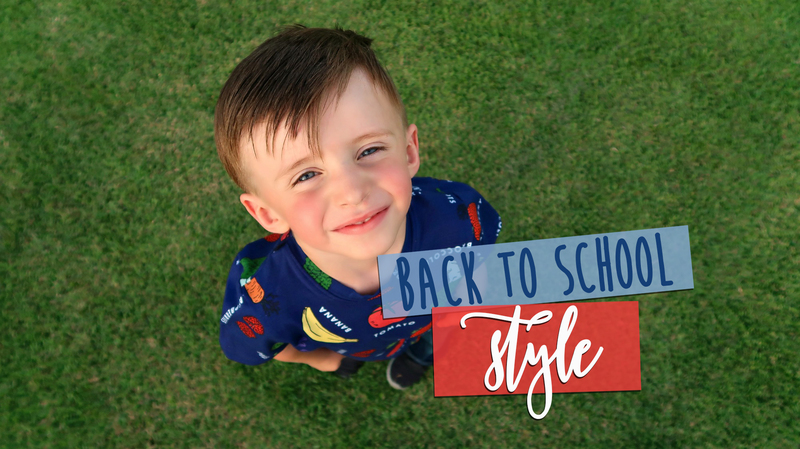 Mitz Kids is a great option for back to school style for kids who don’t require uniforms! They are also fun for after school play for those who do. Avalynn is wearing the Everybody Bakes dress and if you look closely, you’ll see the dinosaur from Aidan’s shirt on top of little cupcakes throughout her dress! Other cupcakes feature little tractor toppers from Andrew’s shirt pictured below. Such a fun way to match them! Mitz Kids clothing features developmentally appropriate designs that are free from gender stereotypes. Bright colors and fun prints in kids’ favorite things decorate all of the pieces Mitz Kids offers. For example, Andrew has had big interest in tractors and outer space and Aidan has loved dinosaurs and food–all of which are fun print options! How cute are those dinosaur spikes on the back?! These clothes are made from high-quality, durable fabric (jersey knit cotton) that can withstand all of the playground activities, fort building, and cartwheels they may inspire! Head over to www.mitzkids.com to learn more and grab some cute items for your little ones! FTC: We received complimentary items to facilitate this review. All thoughts are my own. Next post Back to School Germs? Save Money on Prescriptions with SingleCare!